Sizzle. Shots. Smoky. Stabbings. Sultry. And all that jazz. No one at Kingswood Oxford has seen quite a production on the boards in the Roberts Theater. 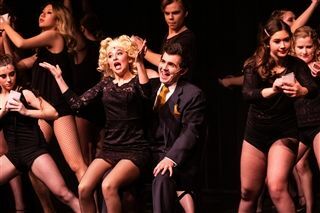 Wyvern actors brought the necessary intensity and heat to deliver a professional rendition of one of the longest-running Broadway productions of Chicago: The High School Edition. The story tells the true and tawdry tale of gin-soaked Chicago in the 1920s. Chorus girl Roxie Hart (Remy McCoy ’20) murders a faithless lover and convinces her hapless husband Amos (Elan Staedlemann ’20) to take the rap...until he finds out he’s been duped and turns on Roxie. 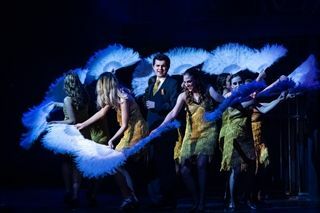 Convicted and sent to death row, Roxie and another “Merry Murderess” Velma Kelly (Katie Bough ’19,) vie for the spotlight and the headlines, ultimately joining forces in search of fame, fortune, and acquittal. 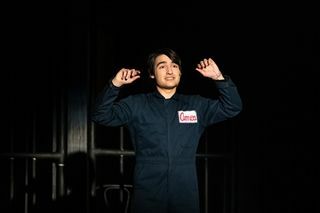 In pursuit of their dreams, a smarmy lawyer, Billy Flynn (Dan Carrol ’19) is happy to oblige (for a price) to play to the sympathies (and naivete) of the jury to get the vixens acquitted of their charges. Optically affecting, the Roberts’s stage resembled an evocatively moody, smoky prison cell block on the lower portion of the stage with an ingenious use of a second level where the jazz musicians played behind a scrim. Led by Music Director Steve Mitchell, the band swept the audience away with the sheer power of the music. Theatrical devices, including effective use of hydraulic risers to allow for the chorus line dancers to enter the stage or ascend to the upper level, added to the visual drama. The dance-driven numbers were on point and clearly, the master class given to the young thespians by Broadway star and Chicago alum Deidre Goodwin, paid dividends. Each hand motion, shoulder shrug, hip shake and high kick of the iconic choreography was precise. Somewhere, in the smoky hereafter, Bob Fosse was tapping his toes with delight. The opening number, “All That Jazz,” set a high bar as Velma led her alluring dancers through the crowd favorite. The actors maintained this energy and intensity from the get-go. 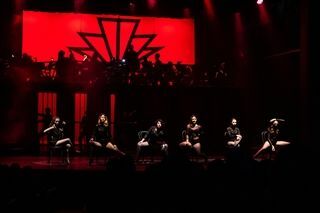 In the arresting number, “Cell Block Tango”, the six murderesses rose from beneath the stage, reasonably explaining how each of their men met their fates: accidentally running into the woman’s knife 11 times or not handling their arsenic cocktail. 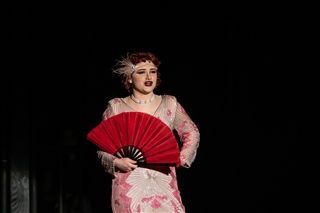 Emma Kate Johansen ’19 as the prison go-to fixer Mama performed a show-stopping tune “When You're Good to Mama” with the pipes of Ethel Merman, guiding the novice Roxy to the inner workings of the prison system that involves a healthy dose of corruption and money to curry favor. The star-struck Velma Kelly and Roxy, who both abide by the adage that there’s no such thing as bad publicity, are eager for the limelight and pay Mama for their chance at stardom. There are no illusions in this dark tale of what drives the American psyche in the song “The Razzle Dazzle” where newspapers are in search of the next headline, the next sensational story. When the tale of Velma and Roxy are no longer top billing in the scandal sheets, and bumped from the news by another illicit story, there’s always a second act as Roxy and Velma, billed as the ‘Scintillating Sinners’ move on to fame and fortune and perform the final act amidst red tinsel streamers and blinking lights. Both lead actresses gave blistering performances and sang with the professionalism that belied their ages. Surprise cameos included Head of School Tom Dillow as the presiding judge, and Dean of Students Will Gilyard lent his bald pate as a prop. Director of Theater Kyle Reynolds, wrote in his Playbill liner notes, “With the advent of court and crime television, the media circuses surrounding the trials of O.J. Simpson, Gianni Versace, Steven Avery Andrew Bagby and more today, you need a three season Netflix season to prove your innocence. With the right lawyer, enough money, the right clothes and a modicum of acting ability, can anyone be acquitted? Is this the truth getting trampled by spin, buzz, and misdirection? At what point have we simply become a razzle-dazzle nation?” There’s nothing more American than that. Kate Beck as Hunyak, Katie Brough ’19 as Velma, Dan Carroll as Billy Flynn ’19, Molly Carroll as Juror One, Charlie Coxon ’20 as Fogarty/Harrison, Olivia Coxon ’20 as Mona, Joey Fago ’20 as Harry, Elise Gendrich ’19 as Kitty, Linda Hu ’19 as Liz , Emma Kate Johansen ’19 as Mama, Sadie Margolis ’21 as Annie, Remy McCoy ’20 as Roxie, Olivia Pear ’21 as June, Spencer Schaller ’20 as Fred Casely, Morgan Siegel ’22 as Clerk, Elan Stadelmann ’20 as Amos, Zachary Waskowicz ’19 as Mary Sunshine.